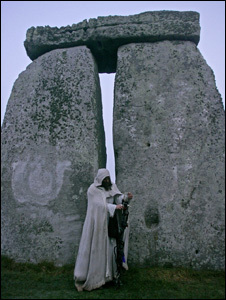 Based on the preceding material and my own experiences, I interpret Stonehenge to be a structure with multiple purposes. It was a monument, of nearly imperishable quality, erected at a particular site of terrestrial energetic power and celestial significance long known by the peoples of the region. It was an astronomical observation device used to predict, in advance of their occurrence, those particular periods in the annual cycle when the earth energies were most highly influenced and charged by the sun, moon, and stars. It was a temple, built by and for the people, in which festivals of renewal were held at those charged energetic periods determined by astronomical observations. It was a structure built with particular materials (the diorite bluestones brought from 240 miles away and showing evidence of prior use in another sacred structure; the micaceous, green-tinged “altar” stone of unknown origin; and the great Sarsen stones), positioned in such a way as to create a specific form of sacred enclosure which functions as a sort of battery for gathering, storing, and expressing the earth energies of the site on the festival days. given your comments on Johnson’s recent book on SH geometry you might enjoy my new monograph at the above site. He greatly understates the ability of the builders. Have a look at my appendices.